Frodo dreams of Gandalf in the abyss, surrounded by darkness and nameless monsters. 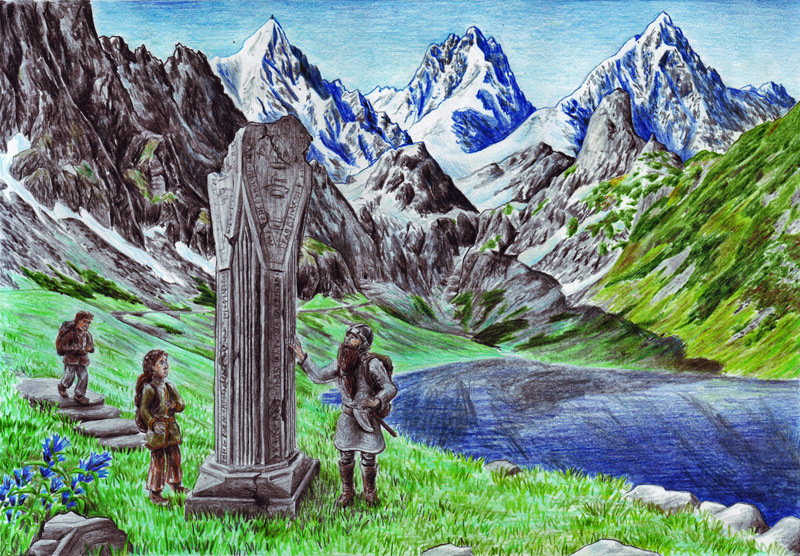 Gimli takes Frodo to look into the waters of the Mirrormere. Aragorn examines Sam and Frodo’s wounds, finding Frodo’s mithril coat. Aragorn leads them to Lothlorien, though Boromir is wary. 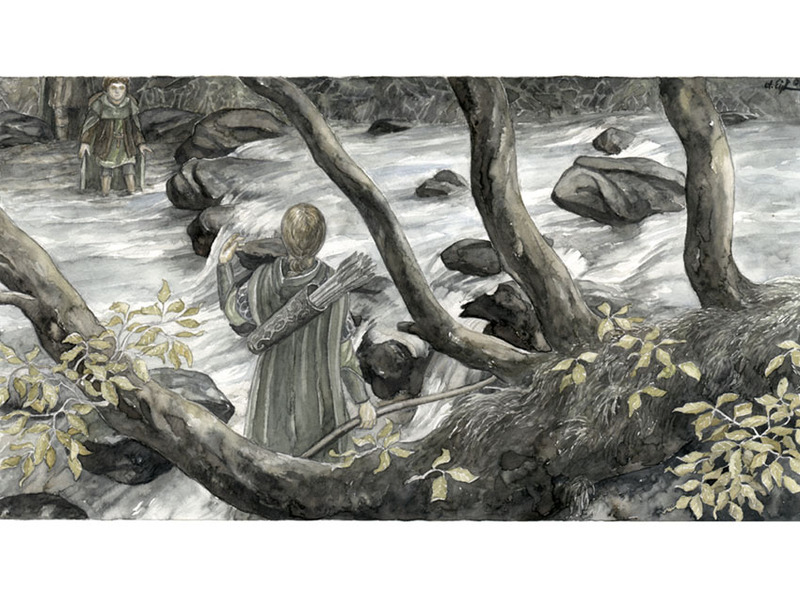 Legolas tells the history of Lorien. Gimli is angered at the suggestion that the dwarves’ actions had threatened the surrounding lands. As the company enters the woods, they are stopped by Haldir. Haldir takes them up into their tree platforms. Soon after, orcs pass underneath. Haldir’s men kill the orcs. Frodo sees Gollum for a brief moment. Haldir takes them to Caras Galadhon. He forces Gimli to be blindfolded. When Gimli objects, Aragorn says they will all be blindfolded. Haldir removes their blindfolds. 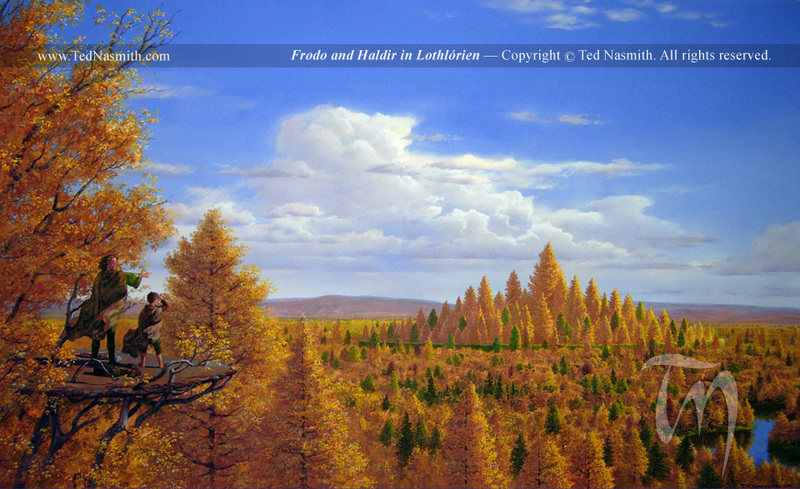 He takes Frodo and Sam up to a high platform overlooking the beauty of the forest. The company meet with Galadriel and Celeborn. Aragorn tells them of Gandalf’s demise. Celeborn blames the dwarves, but Galadriel says it is not their fault. 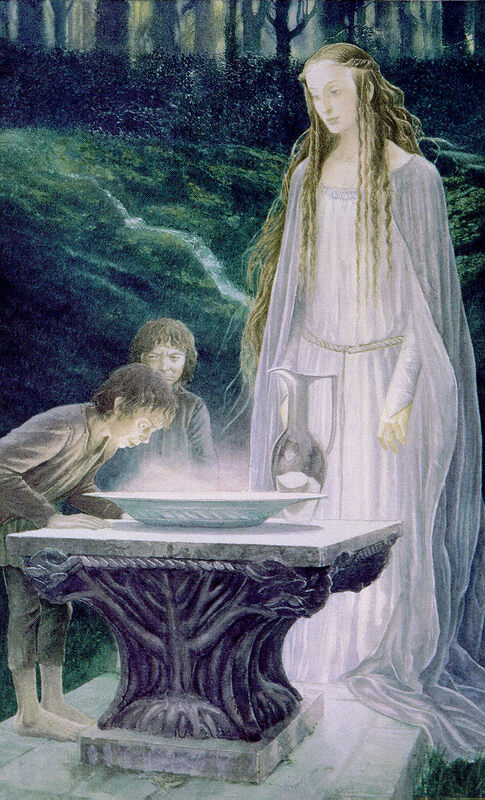 Galadriel searches the hearts of the Fellowship. 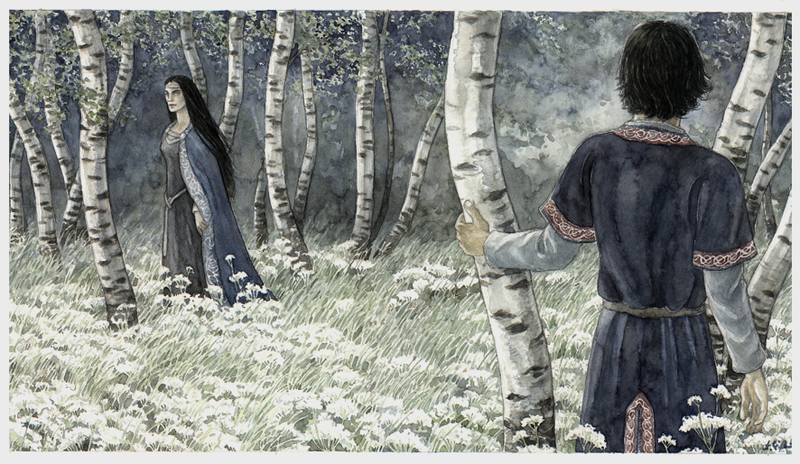 Aragorn daydreams about his time with Arwen in the forest. He also remembers his last meeting with his mother, Gilraen. The Fellowship, and the Lorien elves, grieve for Gandalf. Frodo writes a song in his memory. Galadriel soothes Gimli’s sorrows, using Khuzdul. Gimli attempts to compliment her, clumsily. Legolas and Gimli walk together in the woods, finding friendship instead of hate. 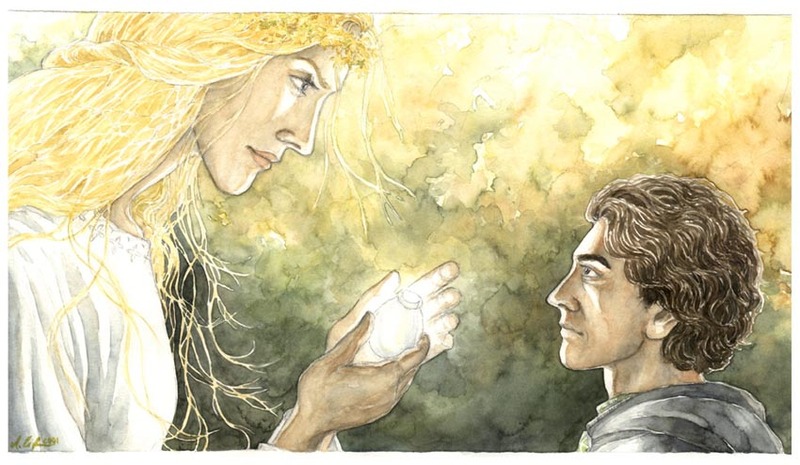 Galadriel takes Frodo to the middle of her garden, Sam follows. She fills a basin there with water and bids Frodo to look. Sam looks first and sees the Shire destroyed. Frodo sees an old white man, ships, a white tower and a great eye. Galadriel tells them it is what may come to pass. She shows Frodo her ring. Frodo offers her the Ring, but after a dark vision she refuses. Aragorn tells the others they must continue. Boromir wants to go to Minas Tirith, not to destroy the Ring. Frodo does not wish to. Galadriel gives them all gifts. The Elfstone to Aragorn, the Phial to Frodo, belts and daggers to Boromir, Merry and Pippin, a box of earth to Sam, a bow to Legolas and three of her golden hairs to Gimli. Celeborn offers each of them to stay in Lorien, but they all choose to follow Frodo. He gives them lembas bread, rope and elven cloaks. 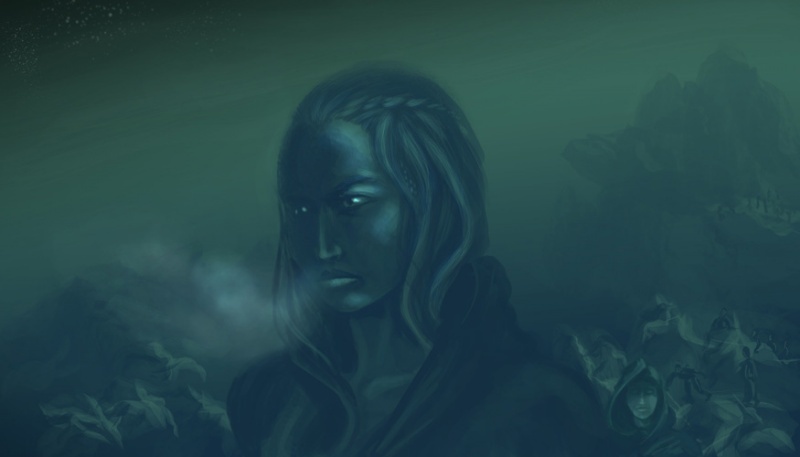 In boats, they leave Lorien down the river Anduin. Saruman sends out Ugluk and the Uruk-Hai to track the Fellowship. Adapted from Chapters ‘Lothlorien’, ‘The Mirror of Galadriel’ and ‘Farewell to Lorien’ of The Lord of the Rings.